There are many 27-inch all-in-one desktops available today, but none of them deliver workstation-level performance according to HP. The company will supposedly fill that void with its new Z1 Workstation, the only towerless machine worthy of commanding your office desk. Sarcasm aside, HP's new system does offer beefier hardware than what you'd typically find in AIO solutions -- assuming you have the coin for it. 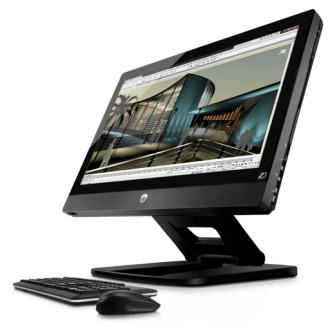 Although the Z1 Workstation is configurable upon ordering, HP has designed the machine so it's easily serviceable with aftermarket components. The system folds back and opens like a suitcase, revealing a tool-less chassis that lets you upgrade the processor, graphics card, memory, storage and seemingly any other component. Cooling is handled by an array of sensor-controlled fans so noise levels are typically around 20dB.